Signature Motorhomes & Leisure is an official Adria, Globecar, Pilote and Le Voyageur main dealer. We offer our customers an extensive choice of brands, types and layouts. Whether you're looking for your first campervan or a top-of-the-range luxury coach built motorhome, our experienced team ensures that the motorhome you purchase not only meets your requirements, it exceeds them in every way. Our involvement doesn't stop there. When it comes to servicing and ongoing customer support we want to continue to exceed your expectations. We're situated in the North West and our 11,000 sq ft indoor showroom offers our customers a great selection of the latest new models available in the Adria, Globecar, Pilote and Le Voyageur ranges. We've selected these brands to offer you the very best options and to ensure we have the right motorhome to suit your lifestyle and your particular needs. We always have a great selection of pre-owned motorhomes too. You'll find us just five minutes off junction 31A of the M6 in Preston, Lancashire. 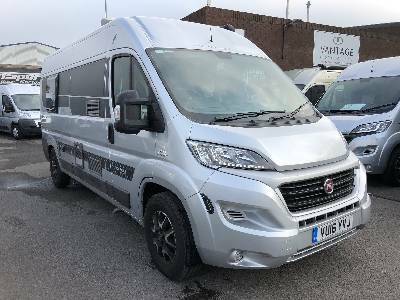 Visit us to browse the very latest models available or choose from a selection of quality pre-owned motorhomes from a variety of leading manufacturers. As an Adria motorhome franchise main dealer, Signature is delighted to offer you a wide selection of award-winning models from the innovative Adria range. If you're considering a panel van motorhome, compact motorhome, coachbuilt or an A-Class we're confident you will find the perfect motorhome for your adventures. A variety of layouts is available, ranging from two to seven berth configurations, and they have all been intelligently designed in Adria's industry-leading state-of-the-art facility. French brand Pilote has over 50 years experience designing and manufacturing motorhomes and whether it's a low-profile, overcab or A-Class motorhome you are looking for, you can be assured that there is a layout that will meet your requirements. With thousands of customisation possibilities you can create the motorhome of your dreams. Add in Pilote's integration of the latest digital technology and you will be perfectly equipped wherever your motorhome adventures take you. Signature is proud to have been selected to be one of only two Le Voyaguer dealers in the UK and we are delighted to offer this innovative luxury motorhome brand. The LV range, the Signature range and the Liner range all combine elegance with the highest standards of technical construction. Brilliantly innovative and refined, Le Voyageur is known for its centralised control system, hand-sewn upholstery, and its avant-garde bodywork. We know you will be impressed. Signature offers a selection of panel van conversion motorhomes from Globecar. They are available to order in a variety of layouts with model lengths ranging from 5 metres right up to 6.4 metres in two, three and four berth configurations. Manufactured in Germany, Globecar motorhomes are known for their first-class quality and highly attractive price points.